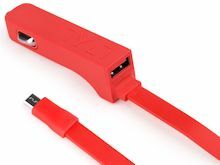 The TYLT RIBBN Car Charger is another smart cable idea from TYLT (see earlier post). This is a car charger -- plug it in to what used to be called the cigarette lighter, and you can charge up your smartphone as it nestles in the coffee holder. The RIBBN has a nice 3 foot flexible cord that won't get wrapped up and tangle, and is rugged enough to hang around in the front of the car. Even better, it has a built-in second universal USB port in the base that you can use to charge a second device. And the RIBBN provides 4.8 amps of power, which means you have full power -- enough to simultaneously charge two smartphones, or even two tablets. The TYLT RIBBN Car Charger is available in black, blue, red, or green -- with an Apple Lightning cable for $49, or a microUSB cable for $49. It turns your car into a full-service power depot for your portable devices. The MyCharge HubMini 3000mAh portable charger combines impressive technology with a convenient size for on-the-go auxiliary power. This handgrip-style unit has two built-in charging cables -- microUSB cable and Apple Lightning, so you don't need additional cabling. The HubMini is built rugged, wrapped in anodized aluminum, and is still under 3 1/2 x 1 1/2 x 1 inches, and less than 3 ounces. MyCharge piles on the technology for its Hub line of chargers with integrated cables, from the HubMini up to the HubUltra for 90 hours of power for phones and tablets. These include faster charging (up to 30% faster than the Apple charger), faster recharging (as much as 4X faster than competitor's chargers), and smart device detection and circuit protection. These also can simultaneously recharge the battery while charging your device. In addition, they retain up to 60% of a full charge for up to one year, which means you can throw them in a bag and not obsess about needing to recharge. They also will be pre-charged if you buy them off the shelf -- ready to power you up right away. The MyCharge HubMini is available for around $69. It's easy to carry, and provides a quick boost for a flagging smartphone -- or two. 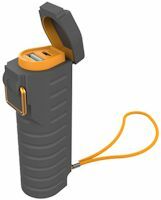 The MyCharge All Terrain portable chargers wrap impressive to-go power like the MyCharge HubMini (see earlier post) in a rugged package. The All Terrain chargers are water-proof, temperature-proof, dirt-proof and shock-proof. They are wrapped in a solid ruggedized exterior with a flip lid on the top with a latch to lock tight to protect the ports from dirt and liquids. They also have an indented power button on the side that displays the battery level. The smaller All Terrain 3000mAh has one USB port that provides 2.1A to plug in a cable to charge your devices. It's around 4 x 1 1/2 x 1 inches and under 1/4 pounds. The larger All Terrain Plus 6000mAh has two USB ports that provide 2.4A to charge two devices. It's around 4 x 2 1/5 x 1 inch and under 2/5 pounds. These also include the impressive MyCharge technology package, including faster charging and recharging, smart device detection and circuit protection, pass-through charging of both the battery and the device, and long-term power storage for up to one year. The MyCharge All Terrain is available for around $39, and the All Terrain Plus for $59. These are smart solutions for securing your portable power. Entries posted to Manifest Tech Blog in September 2015, listed from oldest to newest.